Welcome to a new year, the time for celebrations and resolutions to do better than the last. It’s also the perfect time to take a long hard look at your company’s media and marketing products and make sure that your style and brand look as fresh as the date. 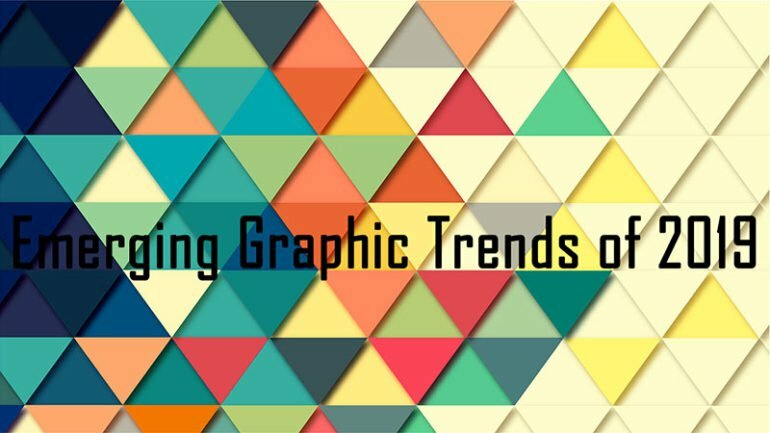 For some much-needed inspiration, here are the emerging graphic trends for 2019. The first place to explore is color. While many other elements might seem to be more important, color is always the first thing perceived. Sherwin-Williams predicted a bold color palette, which appears to include neon pastels matched against every shade of black. In fact, Pantone has announced that Living Coral (16-1546) is the Color of the Year for 2019. Some say that the most significant influences to this year’s design outlook are the numbers of the year themselves. Twenty Nineteen contains several psychological effects, due to the inclusion of descending sequential numbers. This will be a year of looking back and looking at where we are going. The simplicity of the sequence will inspire simple designs. Simple fonts and flowing scripts are expected to turn up everywhere, with lots of negative space. For 2019, paper is decidedly going in a more natural, raw direction. Recycled paper and paper made from natural fibers have become much more popular. Experts in the know are talking about shortages and the high cost of coated paper having a massive influence over what paper mediums are being used. Companies like Amazon and eBay have given a boost to the box printing industry, making prices much more competitive. Meanwhile, fashion designers and outlets like Vogue and Prada have gone retro, and are all about the best (and worst) of the ’80s and ’90s. Everywhere you look, the look on the streets is “throw-back.” This means high contrasting colors with smooth fonts and flowing elements. As the numbers go backward, it is no surprise that this will be a vintage loving year, so get out your best retro for the occasion and get ready for the old to be new again! So far, the emerging designs have been a continuation of the same themes of 2018, with the volume turned up. Simple will turn into very-simple, bold will explode, and natural themes will go wild. The 80’s/ 90’s retro rehash will bring animal prints and basic geometry back mixed with electronic lights and worn out grunge. Without a doubt 2019 is shaping up to be a graphically fantastic year.